Many choices, Griffey Jr. swings as if someone is technically describing the process of a correct swing. Which is beautiful in Itself. I do love Bonds swing though, so violent. Griffey Jr. obviously wins the beauty contest. As for more recent players, Kris Bryant has a gorgeous swing for a right-hander. Forgot about Thome. That video was a good reminder. people that doubted this dont know what a good baseball swing looks like. I have nothing against Jr. but the fact he has a smooth 1 hand follow through is fooling so many of you. Don't need a thread for this. You got the correct answer in your post. My thoughts exactly. Bonds has a better technical swing. More compact, flatter plane. 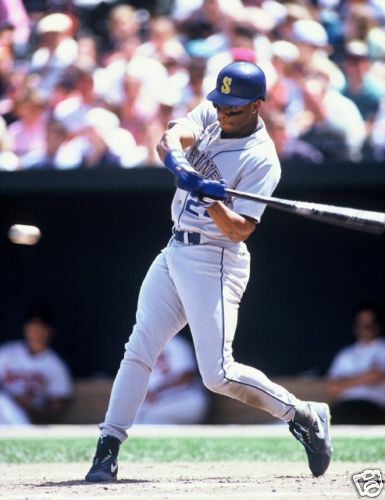 I would tech a kid the Bonds swing over the Griffey swing. Uhhhhh, no. His follow through has nothing to do with his swing. From start to finish there is almost zero wasted motion and everything is moving in unison. His hands get through the zone at the exact right time for the torque of his upper body to come through for maximum power. It's about a technically perfect as you can get. Contact hitters almost always have different swings. Boggs and Gwynn could both hit mistakes but they could also hit the best pitch a guy threw at them. It's about a technically perfect as you can get. A technically perfect swing is flatter. His is an uppercut. That Boggs gif is a thing of beauty, its so perfect! All great left handed hitters have an uppercut. The first gif is from the HR derby so every swing was an uppercut. The 2nd one was from a no doubter. It was to show his swing mechanics. Here a still shot. Everything is where you want it to be at the exact right second. Cubs fan, pay no regard to his comments.